Butler is IEI's third winner of the bi-annual scholarship essay contest. Her winning essay provided five tips on how to design an energy-efficient building. 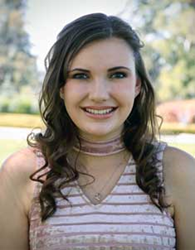 Aubrey Butler is Ivey Engineering's 2018 summer scholarship essay winner. My pronounced love of science is driven by my desire to help solve the constantly emerging problems on this earth. I see myself in the future working towards solutions that are sustainable and viable. Ivey Engineering, Inc., (IEI), an engineering consulting firm, is pleased to announce the winner of the summer 2018 bi-annual scholarship essay contest. The winner, Aubrey Butler of Upland, California, will attend the University of California, Los Angeles in the fall. Butler recently graduated from Upland High School with a 4.8 GPA and will major in biochemistry at UCLA. She hopes to eventually work in the biotech industry. "My pronounced love of science is driven by my desire to help solve the constantly emerging problems on this earth," Butler says. "I believe that this is the only home that we have. I see myself in the future working towards solutions that are sustainable and viable," she says. Butler competed with over 100 other college students from the United States and Canada. Applicants were tasked to write an 800- to 1,000-word essay on one of three topics and were judged for creativity and originality. Butler's winning essay discussed several unique ways to incorporate energy efficiency into a building. One tip she mentions in her essay is properly orienting a building during the construction phase. "The goal is to position the building in such a way that solar gain for energy use is maximized while still minimizing heat gain during hot summer days," Butler explains in her essay. "Aubrey's essay was focused and provided original insight and ideas on energy efficiency," says Scott Friesen, president of IEI. "You can tell that Aubrey spent some time doing research from the quality of her essay," he says. Butler sees herself in the next 10 years pursuing a doctorate degree and doing research to develop compounds that will help alleviate chronic health problems. "We're impressed with Aubrey's motivation and where she wants to go in life," Friesen says. Any potential or current college or university undergraduate student within the United States or Canada is able to apply. The next deadline for essays to be submitted is Nov. 1, 2018. For contest requirements or for more information about the scholarship, visit IEI's scholarship web page. IEI is an expert witness and building systems consulting firm in San Diego, California. Established in 1994, IEI services clients in over 40 states and in several Canadian provinces. IEI's consultants have experience in the design, construction, service and repair of HVAC, plumbing, fire sprinkler, fire alarm and life safety systems, as well as energy efficiency related issues. To read more about Ivey Engineering and its consulting services, visit the company’s website.